Oil prices plunged below $120 a barrel on Monday for the first time since early May as storms appeared unlikely to affect oil and gas facilities. 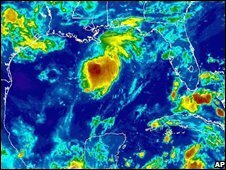 There had been concerns that Tropical Storm Edouard could damage offshore drilling sites in the Gulf of Mexico. Light, sweet crude fell to $119.50 in New York before recovering slightly to trade down $3.92 at $121.18. Weak US consumer spending figures also fanned fears that demand for fuel could drop as the US economy slows. Earlier in the day offshore operators such as Shell and Chevron evacuated staff from some of their drilling platforms, but there was little sign of any slowdown in production. London Brent crude for September delivery fell $3.28 to $120.90. Light, sweet crude has now fallen 18% from its record $147.27, set on 11 July. "Crude futures are down despite a brewing storm and that shows you how momentum has shifted in this market," said Phil Flynn, analyst at Alaron Trading in Chicago. Adding to the downward pressure on oil was a speech by US presidential hopeful Barack Obama in which he proposed selling 70 million barrels of oil from US strategic reserves to lower petrol prices.